A 46 year old man presented with a painful left mandibular mass. Subsequent investigations confirmed an organ of Zuckerkandl primary paraganglioma with metastases to left mandible, inferior ramus and T6 vertebral body on a background of SDHB mutation. Catecholamines were elevated and hypertension controlled on phenoxybenzamine 20mg b.d and perindopril/amlodipine. 14 months after disease stabilisation with 177Lu-DOTA-Octreotate (LuTate) peptide receptor radionuclide therapy and radiotherapy, the primary Organ of Zuckerkandl was resected. Post-operative nadir of normetadrenaline level was 3,555 pmol/L (<900 pmol/L) with improvement in abdominal symptoms (Fig. 1). 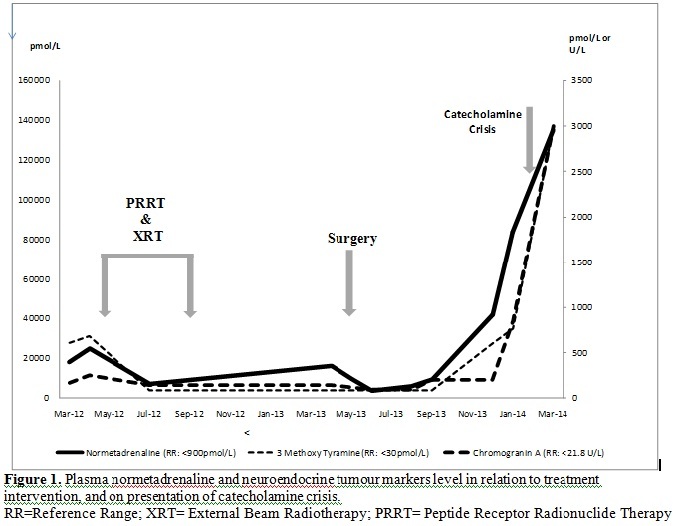 Re-staging scans 3 months later revealed new osseous metastases and exponential rise of plasma normetadrenaline. Sunitinib was commenced. Two weeks later, he developed abdominal pain, constipation and nausea. Admission blood pressure was 230/125 mmHg, he was febrile with a sinus tachycardia of 120 bpm. Hypertension was resistant to intravenous phentolamine, sodium nitroprusside, glyceryl trinitrite and labetalol. CT revealed pseudo-obstruction with dilated bowel loops up to 12.5 cm and faecal loading. Plasma normetadrenaline level was 135,136 pmol/L. The pseudo-bowel obstruction was initially managed conservatively without success. Neostigmine infusion achieved a temporary response in bowel action. Hypertension and constipation persisted, and on day 7 of admission, an urgent low dose of LuTate therapy was administered. Subsequently, hypertension was stabilised on oral agents (phenoxybenzamine 40mg t.d.s, metoprolol, amlodipine and perindopril). His bowels opened weekly post discharge on oral pyridostigmine and laxatives. He remains stable clinically and restaging scan confirms scintigraphic stabilisation of the disease. The exponential rise of catecholamines resulted in pseudo-bowel obstruction (Ogilvie syndrome) and hypertensive crisis. Although alpha-blockade is associated with survival of a paraganglioma crisis, the acute management remains challenging (1). Our case highlights the importance of recognising Ogilvie syndrome, a rare feature of paraganglioma/pheochromocytoma crisis whereby bowel perforation is associated with a high mortality rate (2). Osinga TE, Kerstens MN et al. Intestinal pseudo-obstruction as a complication of paragangliomas: case report and literature review. Neth J Med. 2013;71(10):512-7.